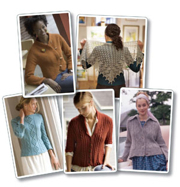 Hey knitters, check out these FREE patterns. Interweave just released “The Best of Interweave Knits: The Readers’ Choice Awards Collection”—a FREE five-pattern e-book containing the most popular patterns published between 1997 and 2007. It’s available for free download on KnittingDaily.com until until May 14, 2008 at 5 p.m., so act fast.